Play through 1/3rds when playing to strikers to midfield player supportstrikers to go 4v4. Retreat to midfield when losing possesion. one touch finish. Passing, turns, Dribbling, reciving side on & back to play. 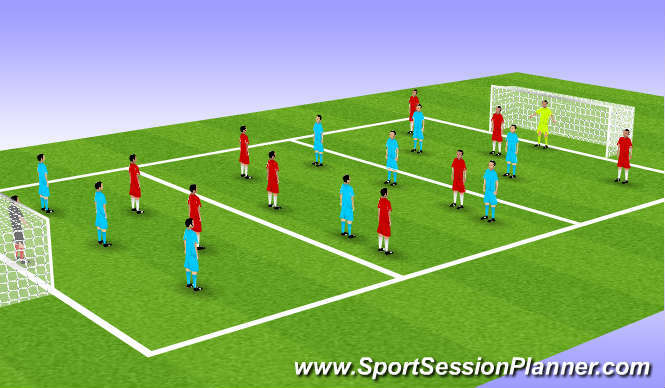 Offering support,hold up play,passing options. High intensive session. Quick passing due to overload in each section. Physical strength holing ball watching for support. Confidence, communication, will to win & compete. Strikers struggled at first to hold good posession untill supportingplayers arrived at first players struggled to get side on and play forward quick.